What is so special about the Kinetic movement? Kinetic watches are some of the greatest innovations from Seiko. They combine the power of both mechanical and quartz watches. In this article, we’ll list down the best Seiko kinetic watches in different types of timepieces. This highlights the flexibility and uniqueness of this new platform that Seiko offers. One of Seiko’s kinetic timepieces is the SKA371, an eye-catching sleek dive watch. This is a timepiece you would love to wear on almost any occasion. The design makes it a watch begging to be worn. Backed up with Seiko’s innovative technologies, it is surely functional and definitely worth its price. Analyzing the overall design of the watch, the SKA371 exudes a sleek and cool design fit for an outdoor timepiece. It is entirely made out of stainless steel, with a few touches of black to complement the appearance of the watch. Its bezel is black, highlighting the white numbers for its minute marks. Its white hour markers also fit the black dial design. It’s worth noting that the case is thicker than quarts or other normal automatic watches since the kinetic mechanism inside takes more space. Don’t be fooled, it actually looks bigger than its real size. Key features of the Seiko SKA371 include its 5M62 caliber which helps keep good time and the LumiBrite technology allowing a safe, clear, and radiant lume for the timepiece. It is an excellent companion for outdoor adventures especially for water sports. Being a dive watch, the SKA371 features its 200m water resistance that is ISO 6425 certified. When underwater, the lume shines brightly and clearly for hours using the timepiece’s LumiBrite technology. This makes it easier to read the time underwater and even at night. Overall the SKA371 is a great kinetic timepiece from Seiko. Being a diver’s watch, it opens up a lot of potential to where and when you can bring it. The design makes it more dress-worthy, giving a cool and sleek feel to its entire appearance. As a dive watch, its bright lume and 200m water resistance makes it great for scuba diving and other water sports. Another pride for Seiko’s dive watch collections is the Prospex SUN023 Kinetic watch. This is a sporty and playful timepiece, playing with a bit of orange color on an otherwise strictly sleek-looking piece. Being a dive watch, its potential for use is also diverse, from outdoor adventures to dives. The design for the Prospex SUN023 is fun and sporty, showing quite detailed work. It features large and legible hands, markers, and symbols to help people reading the watch underwater or at night. It has orange and white bezel markers with the dial being as equally playful with its color scheme. It has white hour markers, orange minute hand, blue and white hour markers both symbolizing local and set hour. For the internal machinations of the Prospex SUN023, it is powered with the 5M85 caliber, offering more charge retention than its predecessors. The 200m water resistance makes this dive watch excellent for water sports and for dives. Utilizing LumiBrite technology, it offers a great and long-lasting sight for the watch when diving, something that avid enthusiasts will appreciate. The Prospex SUN023 features a cool and fun take on this kinetic diver’s watch. Rated at 200m, it is excellent for scuba diving and for other water sports. It has a unique dial that is color-coded to its different hands, making it easier to use on dives or at night. Adding its LumiBrite features make it much easier to read. It is fit for informal and outdoor adventures. For a more formal and classy looking timepiece, Seiko offers the SKA366, a kinetic dress watch meant to impress. This is a two-toned watch that attracts the keen-eyed for its aesthetically-pleasing combination of gold and black. Normally, dress watches have silver cases that make them stand out. But the beauty in this watch is the boldness of both colors, complementing each other magnificently yet subtly. As a dress watch, the Seiko SKA366 features an eye-catching design. The two tones create a subtle, yet obvious aesthetic that may not be obvious at first sight, but a second look at its black steel façade and gold strips will definitely turn you around when noticed. It is a kinetic timepiece powered by Seiko’s 5M62 caliber. It has a 39.5mm case diameter that fits just right. It is a fully stainless steel watch whose colors define its character. There is a calendar placed on the 4 o’clock mark which is a subtle move from the usual 3 o’clock placement. The gold accents are found along the stripes, its crown, bezel, hour markers, and hands. The Seiko SKA366 is a dress watch that bares its charm subtly. 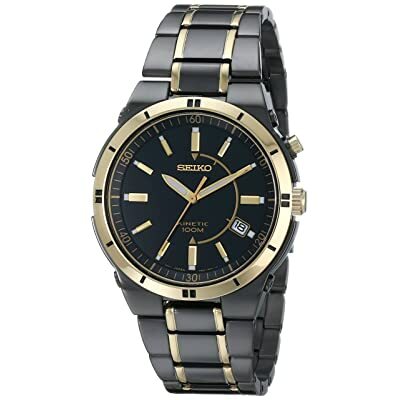 It is a two-toned timepiece that features gold on black for its colors, an excellent combination for special occasions. Its water resistance is a welcome addition, giving it resistance when accidentally spilled with water. It’s also noteworthy that Seiko’s water resistant technology is one of the most reliable in the market, so you’re assured of quality. For people who want a simple, yet elegant dress watch, then the Coutura might be the perfect fit for you. It features a simple stainless steel timepiece with a white dial that complements the simplicity of its band. It is a neat dress watch that can be tricky but elegant to match with. The design of the Coutura Retrograde leans to the clean and simple side of watch aesthetics. It has a silver band with gold accents that appear on the dial, bezel, and the middle row of the band. This middle row is a unique look because of its sharpness, unlike normal triple-row bracelets. The bezel is enveloped by a gold lining at the outer edge. The dial is a unique wonder on its own. Although it has a simple white background, it has gold hands and hour markers. The addition of the day-of-the-week indicator adds flair along with a date window at 3 o’clock. The Coutura Retrograde plays along the features of a kinetic timepiece. It is a dress watch powered by the caliber 5M84, offering a reliable movement along its kinetic properties. It is a practical offering from Seiko playing with the idea of arm swings powering the luxurious piece. The 100m water resistance rating is also a great waterproofing addition that prevents unnecessary trouble with water. The Seiko Men’s Coutura Retrograde is a bold timepiece that draws attention to it immediately. It features a stainless steel embellished by gold. The dial is also unique through its day-of-the-week calendar accompanied by a day feature. If you opt for a dress watch that is sure to capture attention, this is the timepiece for you. Brave, bold, and unique describes the watch. The sturdy and active feel of the SKA723 matches the kinetic properties of the timepiece. It presents a classic look for most watches of its type and fits a lot of outfits and can be brought to a variety of places. It is simple, sturdy, and fits all lifestyle choices. The look of the Seiko SKA723 is straight to the point. It features a stainless steel case, a brown leather strap, and simple markers at the dial. This creates the overall character of the timepiece. It is casual and sturdy, fitting a lot of outfits and can be brought from informal outings, outdoor adventures, and even formal gatherings. The SKA723 field watch is powered by Seiko’s 5M82 caliber. A recent version compared to other calibers, it is aligned to help with the watch’s sturdiness while remaining efficient. As a kinetic timepiece, it still relies on your movements to keep ticking. This makes its large demographic fitting as it can be brought anywhere, helping it remain wound up every time. The Seiko SKA723 offers a casual field watch that boasts simplicity and ease of matching up with. If you opt for a timepiece that has its basic functions set and is extremely easy to style with, then this is for you. The large dial makes it easy to look at and its design makes it dress-worthy to almost any occasion. Another simple but bolder field watch is the Seiko SKA272. It features the simple characteristics of a timepiece but is very charming with its own character. It is a great kinetic timepiece that offers style versatility for its casual style. For its design, the SKA727 features a stainless steel case that is emphasized by its black nylon strap and eye-catching black dial. These characteristics make the watch bold yet simple through the lack of design additions. It can match a lot of outfits for most outdoor and casual activities but may need more considerations when brought to formal events, though it is still possible. The timepiece is also powered by the 5M82 caliber, producing good movement along with its kinetic properties. It offers the basic functions of a classic wristwatch without the modern complications added from today’s innovations. Overall, the Seiko SKA727 field watch is a good option for a unique kinetic timepiece. It matches perfectly with its casual and simple style with informal or outdoor gatherings. If you opt for a timepiece that can be brought almost anywhere aside from formal events, then this timepiece is a good choice. It matches with a lot of outfits and is easy to use with its large dial markers. Kinetic watches are a hybrid of mechanical and quartz mechanisms. It combines the two platforms and creates a unique type of movement for the timepiece. It absorbs the swing-powered quality of the mechanical with the battery-powered property of the quartz. Released by Seiko in the 1980s, the kinetic movement was powered by charging up an internal capacitor through the arm’s swings and movements, and is discharged as it continues to be used by the wearer. Essentially, it is a rechargeable battery powered by the continuous swinging of the arms as it is used in daily life. Regarded by Seiko as the watch movement of the future, there is a lot of potential in kinetic timepieces. The platform is still being developed by the brand to be able to store more power and lose the least amount while not being used. It is definitely a great choice for people who like unique timepieces. Seiko has contributed greatly to the advancement and growth of timekeeping since its establishment in 1881. It is undeniable that the company has already set a firm and stable foundation in the growing watchmaking industry. Its several achievements make it a trusted and reliable company that offers innovative and sturdy timepieces that are well-loved globally. Through all of these innovations in the watchmaking industry, it is no wonder that Seiko is still celebrated as one of the most successful and trusted watchmaking company in the world. Their thirst for innovation and reliability has made them a staple in most topics when it comes to choosing the most valuable watch for its price. Seiko believed and still believe in the potential of kinetic timepieces. It offers the best of both worlds with mechanical and quartz platforms by integrating both. The article highlights the best Seiko kinetic watches, showcasing reliable features with a great fir for the kinetic platform. The movement is relatively young, but shows a lot of potential. This proves the strength and prowess of Seiko when it comes to creating innovative timepieces. With their array of technological achievements, the future is bright for the watchmaking company.